I would like to invest Rs. Your interest will get added to your principal amount at the end of each quarter. Minimum FD value required is Rs. Maximum FD value is Rs. Change the option to monthly credit and your monthly interest will be deposited as an SIP instalment! You can choose any amount, tenure and interest option to earn easy returns! *This is an estimated maturity amount. *This is an estimated amount. Mobile Number Please enter registered mobile number. Invalid mobile number. If you’re not an IndusInd Bank customer, Kindly provide us below details and continue booking Fixed Deposit. I am providing my valid Aadhaar number and PAN Card details . I hereby state that I have no objection in authenticating myself with Aadhaar based authentication system for the purposes of availing Banking Services from IndusInd Bank. Our customer care representative will contact you shortly. Amount to invest Please enter fd amount. Minimum FD value should be greater than 10,000. Book a Fixed Deposit online in a matter of minutes, wherever you are. Book Fixed Deposit by pulling funds from other Bank accounts. 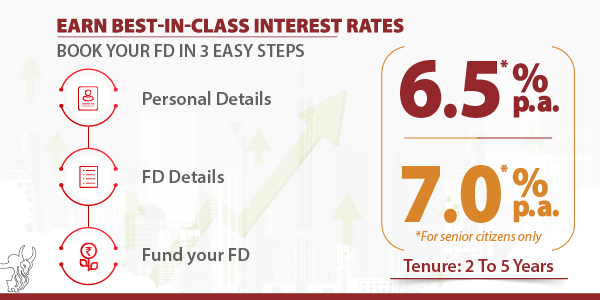 Book a Fixed Deposit and choose the amount, tenure and maturity instructions. Do I need to be an IndusInd Bank account holder to book a Fixed Deposit? Online Fixed Deposit can be opened only by IndusInd Bank customers, non-IndusInd customer can leave their details and will be contacted by our representatives. Do I need to provide any documents for opening the IndusInd Online Fixed Deposit? Existing customers do not need to provide any documents however new customers will need to provide an identity and address proof to our branch representatives. As a Senior Citizen, do I get any extra benefits? Yes, you can enjoy higher interest rates. The whole experience was seamless. I could open the Fixed Deposit with only my Aadhar and PAN details sitting in the comfort of my home with no physical documents required. I’m pleasantly surprised at how simple and easy it is to bank online. Booking an FD has never been this stress-free, I was done in exactly 5 minutes. I would recommend others to experience this simple process for themselves! Booking my FD was an absolute breeze. Since I’m always on the move, I don’t find enough time to visit my bank, so this definitely solves a major concern and the helpful calculator simply takes my confusion away!